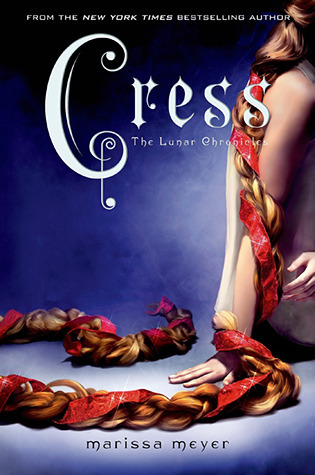 Presenting The Lunar Chronicles #3 Cress by Marissa Meyer. It is not an easy task to maintain a varied cast of characters, keep their identities separate, develop them and then introduce and incorporate newer ones with every book. But Marissa Meyer does just that and her fairytale re-telling Lunar Chronicles is proof of such. We saw Cinder (Cinderella), then Scarlet (Red Riding Hood), its Cress' (Rapunzel) turn now and she is just out of the world ..... literally. The unwitting spy for the Lunars, Cress lives in a satellite that orbits the Earth and may well be the biggest damsel in distress ever and fantasizes about one Captain Carswell Thorne. Adorable. Coming off as naive at first Cress soon evolves from the damsel to a heroine throughout the events of the book. She is a genius with technology and very resourceful too. Be it her past, present or her future, it was unique to experience the story through her eyes. And if surprise storms come her way ..... well then damn, she braves it like a pro. Thorne gets his moment finally. He is not the perfect guy. He is sarcastic and doles out charisma in spades. He is also of course fun to around. To see him fantasized about by Cress and their eventual realizations of reality and romance was a nice and sweet backdrop to the ugly war with Queen Levana. Of course, Cress and Thorne are not the only ones here. Cinder, Scarlet, Kai and Wolf play their parts too. They all help in telling what happens next in their fight and rebellion against Levana and the Lunar Oppression. As with its predecessors, the pacing of the story is on point. Meyer does a great job of keeping her characters separate and unique You may scoff at the length of the book but once you start reading, all such thoughts go out the right ear as you just won't be able to keep the book down ..... not once. With the near completion of the series Hard truths are revealed and newer characters introduced with Winter and Jacin. Iko who gets a new body and wins the outstanding prize for spunkiness, takes us by storm You can't help not like her revamped self. With its explosive finale, i'm more than ready to learn what happens in the final book 'Winter'. "Addicting. Just can't get enough of Marissa Meyer's world"
i LOVE this book and i can't wait for Winter to come out soon! Ahhh I still have Cinder on my tbr pile. These sound so good!